April, 2011 | Isabelle Chrun M.Sc. Happy Endings off to a great start. I know what you are thinking, why would we want another Friends rip-off? 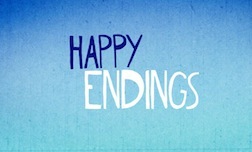 Yes, Happy Endings is another TV series about six friends hanging out, but it is more than that. It felt like a breath of fresh air to watch a fast pace comedy among all the reality shows out there. With Happy Endings, you won’t see the jokes coming, they’ll take you by surprise like a guy in roller-blades crashing your wedding. The punch lines delivery rhythm is on fast forward. They managed to cast an “Excellence in Theatre” award winner, the girl next door Elisha Cuthbert from 24, a superb comedienne from the final two seasons of Scrubs, two Saturday Night Live alumni and a guy who played a Young Hollywood Douchebag in Californication. Can you guess who’s playing who? If you are a TV nerd, you will recognize the wittiness of the script writers and directors Anthony and Joe Russo (Arrested Development or Community rings a bell?). Check out some memorable quotes from the pilot.